In the late 1980s, inland aquaculture in Poland produced about 20 and 4 thousand tonnes of carp and trout, respectively. In 2016, the total volume of the sector’s production increased to over 35 thousand tonnes, including 18 and 16 thousand tonnes of the two species and above 1 thousand tonnes of another fish. This constitutes 94% of total catches of inland fish and about 15% including sea fishing. Globally, roughly 50% of seafood supply is produced by aquaculture, and farmed fish production exceeds that of farmed beef. The EU’s Blue Growth Strategy identifies aquaculture as a sector which could boost economic growth across Europe. 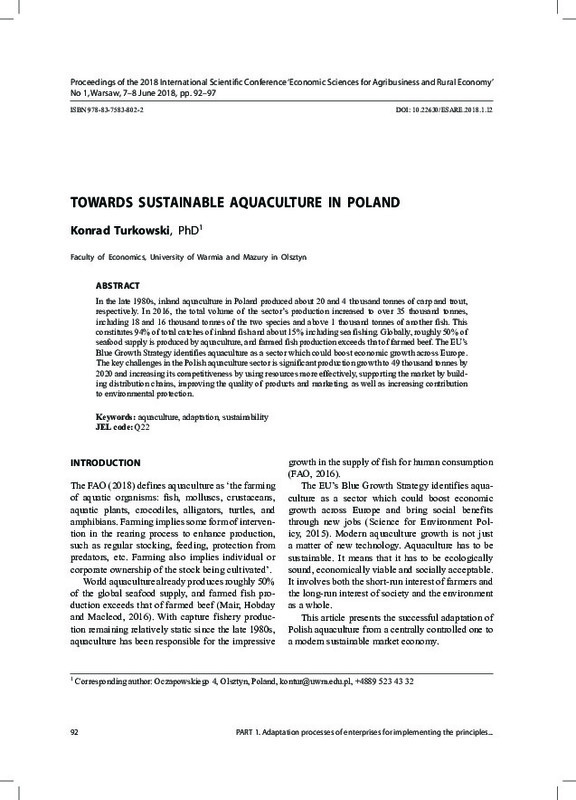 The key challenges in the Polish aquaculture sector is significant production growth to 49 thousand tonnes by 2020 and increasing its competitiveness by using resources more effectively, supporting the market by building distribution chains, improving the quality of products and marketing, as well as increasing contribution to environmental protection.